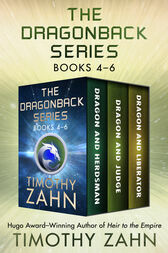 The final three novels in the Dragonback sci-fi saga from the #1 New York Times–bestselling and Hugo Award–winning author of Star Wars: Thrawn—“Enthralling” (Science Fiction Chronicle). Young fugitive Jack Morgan and alien K’da warrior Draycos are inseparable—quite literally. They’ve been together since a desperate Draycos was forced to bond with Jack as his host in order to survive. Now they’re traveling the stars trying to clear Jack of a crime he didn’t commit, bring down a conspiracy to destroy Draycos’s people, and generally stay alive . . .
After nearly being caught, Jack and Draycos are rescued by Alison Kayna, a reluctant mercenary who steals them away to a planet where she plans to meet some friends. But when they get there they see something they never expected: a lost colony of K’da who have all but forgotten their pride and honor. Just when Jack thinks he has a lead to help Draycos on his quest, he’s kidnapped by a pack of aliens—not as a prisoner, but as a judge. Jack has no idea why they think he would, or could, know how to be a judge. But they soon reveal they want him specifically because Jack’s long-lost parents were once asked to do the same thing . . .
Jack and Draycos have traveled a long way and been through a lot of hard times together, and now it looks like their journey may finally come to an end. Their hunt has brought them to the man at the heart of the deadly conspiracy against the K’da, and put him within their grasp. But before they can exact justice, they must stop him from unleashing a weapon of apocalyptic power . . .
Timothy Zahn is a New York Times–bestselling science fiction author of more than forty novels, as well as many novellas and short stories. Best known for his contributions to the expanded Star Wars universe of books, including the Thrawn trilogy, Zahn won a 1984 Hugo Award for his novella Cascade Point. He also wrote the Cobra series, the Blackcollar series, the Quadrail series, and the young adult Dragonback series, whose first novel, Dragon and Thief, was an ALA Best Book for Young Adults. Zahn currently resides in Oregon with his family.